When I started Gourmet 50 Women Game Changers, Mary from One Perfect Bite was half way down the list. I checked out her list and noticed that Ree Drummond from Pioneer Woman was on the list. Also Paula Deen and Nigella Lawson were also there to name a few of my favorites. So I e-mailed Mary and let her know I was interested She and the others welcomed me with open arms. For the most part, it was a lot of fun, trying out new recipes from these wonderful cooks. Some days were a bit challenging. Such as Severine von Tscharner Fleming. There was not a lot of recipes of her out on the world wide web. Well, none that truly inspired me. I really had to dig for what I decided to make and in the end, it wasn't really her recipe. It was something that she inspired me to make. 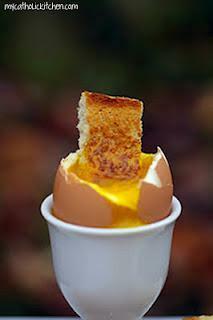 You can get the recipe for soft boiled eggs here. The other was Anne Sophie Pic. Most of her recipes, the few I could find, the ingredients were hard to get. There really was not a lot written about her. I ended up skipping her altogether. I must confess, I have my favorites and some not so much. I did try to keep it as professional and to the point as I possibly could, regardless of how I felt about a particular person. I must say, my all time favorite was Edna Lewis. Gosh, I wish I could sit down and have a conversation with her. I have her cookbook. I had to order it. I bought it right after we featured her. That is how much this woman inspired me. I love to read about her growing up in Freetown Virginia. 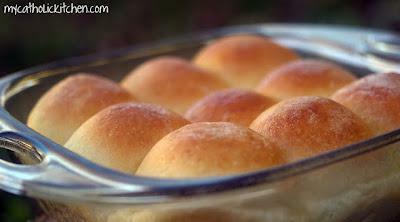 Her Feather Light Yeast Rolls are just that. They certainly did not disappoint. My most disappointing was Julie Powell. The odd thing is the movie Julie and Julia inspired me to start blogging. I didn't think I was computer savvy enough to start a blog, then I found blogger. I loved the movie. Julie Powell, not so much. I thought that if I could get past the potty mouth and god hating, I might like her. Nope, didn't happen. No wonder Julia Child didn't endorse her. Lets put it this way, my mom would say that if you don't have anything nice to say, don't say anything at all. Don't let me dissuade you though, check out her blog here. Well, that's it in a nutshell, the good, the bad and the, well you get the idea. The following bloggers also have put their two cents worth in. I hope you'll pay them all a visit. It is wonderful to see what they all have to bring to the table this one last time.